There’s something quite wonderful about potatoes, onions and butter sautéed until golden and crisp. It’s one of the tastiest ways to prepare potatoes. This dreamy dish is so versatile and adds the missing link to any egg dish or even a simple chicken or beef recipe. I’ve made these skinny by using just a small amount of reduced-fat butter. The Country Fried Potatoes at Denny’s have 394 calories and 20 grams of fat! My skinny recipe has 154 calories, 4 grams of fat and 4 Weight Watchers POINTS PLUS. For a delicious and skinny breakfast this weekend, try these fabulous potatoes alongside Low Calorie Egg White Scramble With Spinach and Onions. Yummy! In a large non-stick pan, melt the butter. Add the onions, potatoes, salt and pepper. Cook over medium-low heat for about 15-20 minutes until potatoes are evenly browned and cooked through. Turn occasionally with a flat spatula however, first allow potatoes to cook for 5 minutes, before turning. Garnish with scallions and serve hot. Any leftovers can be reheated the next day in a nonstick pan thatâs been coated with coating spray. Turn several times with a spatula to heat evenly. For more skinny recipes, please join me on skinnykitchen.com. Thanks Arturo. So happy you enjoyed these potatoes! You’ll find Baby Dutch Yellow Potatoes in bags in the produce section of many supermarkets. I bought them at Trader Joe’s. 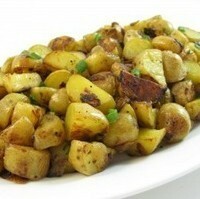 You can also use Yukon Gold or baking potatoes. Just make sure to cut them into small chunks.